This post contains an interview with Mr. Corban Neeley, one of our successful postgraduate students. He has entered the Diagnostic Imaging TEAP program at Canberra Hospital, located in the Australian Capital Territory and is a major teaching hospital for the Australian National University Medical School. TEAP Diagnostic Imaging Medical Physics (DIMP) is strongly linked to the IAEA Clinical Training Programs for nuclear medicine and diagnostic radiology. The title of Corban’s Masters project was: “Real-Time 3D Fiducial Marker Tracking for Use in Arc Radiotherapy” under supervision of Assistant Professor Pejman Rowshanfarzad, Professor Martin Ebert, Associate Professor Michael House, and Associate Professor Du Huynh. “Corban was one of our best postgraduate students. He is extremely hard working and has a creative mind. He is highly organized, self-motivated, and active student. He was awarded High Distinction in his Masters and his research outcome is highly satisfactory. His research updates and presentations in our weekly research meetings were always remarkable. Because of all these brilliant abilities and hard work, he was accepted as a TEAP registrar just a week after finishing his Masters at UWA. 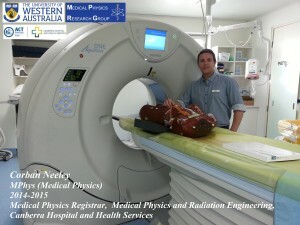 My name is Corban Neeley and I am a Diagnostic Imaging Medical Physics (DIMP) registrar at Canberra hospital. I am working through the Training Education and Assessment Program (TEAP) in diagnostic radiology and nuclear medicine. A DIMP is involved in commissioning and quality assurance of all types of medical imaging devices from dental orthopantomogram (OPG) through to CT and PET. They help educate staff about radiation protection principles and monitor their workplace exposure; calculate and verify radiation shielding requirements, perform patient dosimetry and undertake dose audits on clinical procedures so that they can be optimised: Optimisation involves maintaining an image’s diagnostic quality whilst minimising the radiation dose to the patient. I am also involved in developing computer algorithms to extract quantitative data from medical images using computer vision principles and am interested in Monte Carlo based dosimetry. What have you enjoyed most about UWA? What I enjoyed most at UWA was taking my research skills to the next level. This aspect of the Master’s program is where you challenge every element of your skill profile and get the opportunity to creatively engage in comprehensive problem solving Being involved in a research team not only develops the analytical side but also makes you a better person: Getting to be around like-minded people with different perspectives and skill sets is an invaluable way to grow as a physicist. 1. Medical physics is an excellent way to merge problem solving skills with a very satisfying career. It requires a thorough knowledge of the production and forms of ionising radiation, the interactions with matter and radiobiological effects and has the end product that it impacts upon an individual’s health. Physicists’ tend to have very inquisitive minds and being involved in this field means your thought processes are never far away from the atomic world with all its idiosyncrasies. 2. I have a passion for writing code and medical physics affords many interesting and complex problems that can be solved through computer algorithms. Computational image analysis is extensively mathematical and the ability to write effective code is a very useful attribute that can be utilised in a myriad of ways. 3. The machines used in medical physics are very complex and their appropriate use relies upon the skills of a physicist to test their capabilities. The dependence of modern healthcare on medical imaging is ubiquitous and the ability of a physician to make an accurate diagnosis stems from the assumption that the image displayed is a faithful depiction of the anatomical structure or physiological processes: This assumption is only valid through the ongoing quality assurance that a medical physicist provides. Knowing that all the skills you acquire to become a physicist will be called upon and challenged makes medical physics a fulfilling career. How do you feel you make a difference in your area? I have a propensity for creative computer programming, having come from a musically artistic background. A crucially important aspect of a DIMP’s operational role is to optimise the imaging process. I feel I am definitely contributing in my workplace to a greater realisation of this fundamentally important principle. Without doubt, work very hard to enhance your employability. Medical physics registrar positions are highly sought after in both radiation oncology and medical imaging. Everything taught in the UWA Medical Physics Master’s program is directly related to the job, so give attention to its entire scope and encourage yourself with the reason for your efforts. Good grades can help you get the interview but a good understanding, along with a likeable personality, is what can get you the job. Like many things in life, a sound structure is built upon a solid foundation; the university season is the time when the foundation is laid and you will never regret the time spent doing so. Introduction: Target motion and inaccurate patient positioning in external beam radiotherapy (EBRT) cause errors in the delivered dose: The planning target volume (PTV) is an additional margin surrounding the tumour which compensates for these uncertainties in EBRT. The beams-eye-view (BEV) of the treatment beam can be captured using an electronic portal imaging device (EPID); the resultant image, though low in contrast, can be used to dramatically reduce these locational uncertainties when coupled with the orthogonal kV images produced from an On-board Imager (OBI). To overcome inadequate tissue contrast in the EPID image, gold fiducial markers (FMs) implanted into the tumour can be used as a surrogate target; hence, tracking the FMs can produce accurate knowledge of target motion and the corrections required: This can be used to reduce the margins in the PTV, thus sparing healthy tissue and organs at risk from unnecessary irradiation. Methods: An original FM tracking algorithm was implemented in C++ using a dynamic threshold applied to the region of interest (ROI), followed by a process which extracts both the location and orientation of the 5 mm long cylindrical FM endpoints. The algorithm tracks multiple FMs in the 3D real-world coordinates of the linear accelerator (LINAC) by stereoscopic reconstruction of projected FM locations detected within the EPID. Results: The proposed algorithm produced a root-mean-square error (RMSE) of 0.017 – 0.018 mm, this was calculated using FM positions independently measured in a phantom used to establish a ground truth. The detection speed was an average of 20 ms which delivered computational efficiency valid for real-time applications. Conclusion: This method shows how augmenting the capabilities of the LINACs currently in use by implementing real-time FM tracking can lead to a reduction in the PTV margins: Using these methods to improve patient outcomes whilst offsetting the need to purchase specialised image guided radiotherapy (IGRT) equipment. Once again we congratulate Corban for his great achievements and wish him all the best for his future career as a Diagnostic Imaging Medical Physicist.